I love doing my own numbers. Every year I sit down and calculate my numerology because I want to know – Will it be a year of learning? A year of love? A good time to make a baby? It helps me prepare for what will flow easily and what will require work. And considering it was a numerology reading that spiraled me forth on my Yoga Goddess path, I know how powerful working with the numbers is. Which is why I started questioning: Should I offer numerology readings before the New Year? I wanted to know what was so great about doing numerology sessions with me? Definitely not what I was expecting but I’ll take it! I was smiling big when I read that note from Janice. Like the magic I received from my first numerology reading was passed along to her. 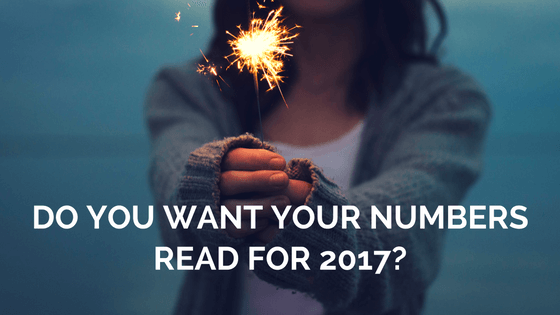 Do you want your numbers read before 2017? After hearing back from Sam and Janice I decided YES! I will be offering numerology readings in time for the New Year. What can I expect in the year ahead? When is a good time to start my family? How can I attract love in my life? If you answered YES! Then fill out the form below and on Tuesday I’ll send you an email with all of the details of how to book your 2017 reading. Nothing would make me happier than to help you change your life for the better! I already have my appointment booked and can’t wait to hear what 2014 will bring my way! What a great offer Zahra! I love your enthusiasm Beth – and I love that you’re so committed to investing in yourself!